Interesting game but there is one big balance issue with food production. Currently you can only lose a maximum of 1 food per turn. Even if you completely stop all food production activities, you will still only lose 1 food per turn. That's why it's a lot more effective to just skip food production chain completely and focus on more valuable resources. You can then just buy all the food you need from caravans. My other issue is with game difficulty. I have played a bunch of games already and haven't felt threatened at all because the AI factions seem to be really passive and the bandits don't attack me at all even though my military is tiny. Maybe in the future give us an option to tweak the AI aggressiveness. You can only lose "1 food" because the amount of food you have in storage is expressed in units of "the amount of food I need to feed everyone for 1 turn". So yes, when you have no food production, it drops by 1. If you hover over the food it will show you the detailed calculations. You can certainly buy food from caravans, but buying it all is normally not a winning strategy. Bandits generally only attack quite local to their base. Sometimes they do come in and attack for real though, or steal your outlying units (explorers, prospectors, etc). They are quite weak, so even an archer can generally fight them off. The other tribes are usually quite passive, I agree. I think it needs more work to make them more dynamic. Buying all the food is actually a winning strategy if you think about it. 1 unit of food only costs 2 gold, so with zero food production you lose 2 gold per turn but you free up many clans to do other things. Just 1 clan assigned to digging, for example, easily produces more than 2 gold worth of good per turn. so I don't really understand why would anyone want to produce any food. It just isn't worth it. There often isn't enough food in the caravan to feed all the people for the period before the next caravan. Internal food security remains an issue. Maybe it worked differently in the older versions but in the newest version 1 food from the caravan equals 1 stored food turn so even a large tribe only needs to buy 15 food from the caravan to survive for 15 turns. That cannot be right. Hey Bossman, maybe you could post a ss of the issue? In my current game I got 10 clans and food consumption of 4.4 food per turn. As you can see I got 2 stored food turns. 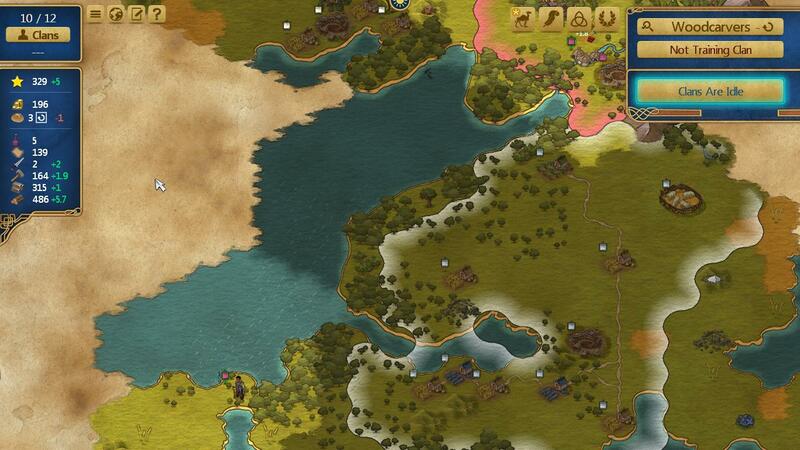 Then in the same turn I buy one single unit of fish that costs me 3 gold. Voila! My stored turn counter increases to 3. I checked and can do the same thing. You are right. I apologise. I could have sworn I have tried it and found it working properly. Reproduced this. 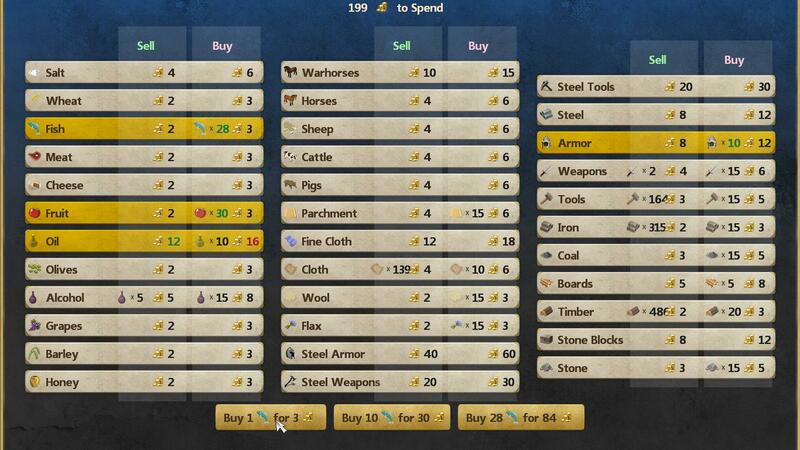 I can buy one unit of any sort of food item from Caravan for 3g, and get a whole day's worth of food stockpile for my 40 clans. And since the confusion is caused by the confusing way of showing food stocks. Please just show the REAL food stock and not how many turns you have left. That is how everything else works, and I could argue this is confusing users, but I don't need to. We already have solid evidence it even confuses the developers MAKING the game. So just stop it, and make it sane. It does allow for stuff like spoilage. With an absolute amount of food that would be more difficult.. From what number on should it spoil? End game food usage is about 100 times more then early game... So set the bar too low and end game winter becomes a problem, set it too high and early game food won't be an issue in the winter. Even ignoring the caravan food exploit, the food calculation is a bit nonsensical. On turn 1, the Goths start with 15 turns-of-food to feed 3 families. They are producing 0 food, so will lose 1 turns-of-food at the end of the turn, with 14 turns-of-food remaining for those 3 families the next turn. Makes sense. Except that next turn they have a new clan join, and so now have 4 families to feed – but still apparently have 14 turns-of-food in the stockpile. Shouldn’t it now be roughly 10 turns-of-food due to the 33% increased consumption? Also, the spoilage system seems fairly strange. Late game I had about 100 turns-of-food stored thanks to a few wheat farms and a glassblowing warlock (and purchasing 2 years’ worth of cheese from the exploit merchant), so any surplus food was lost to the ~99% spoilage. I realised I could toggle off grapes as an optional food source at that point, so suddenly had an income of about +200 grapes/turn, with food/turn unchanged (again due to spoilage). I guess the grapes were only going to rot if I planned on eating them? Really interesting mechanic, it just seems a bit off as currently implemented. I talked about this in another thread. Supposedly, all the food becomes "turns of food" at some point. This is a problem. Foraging doesn't give its value in food to the amount of turns of food except after a huge reduction of value. Then when a new clan joins, the same amount of turns remain in the "stockpile". It would be much better if turns of food was not a hard value, but rather a calculated soft value. 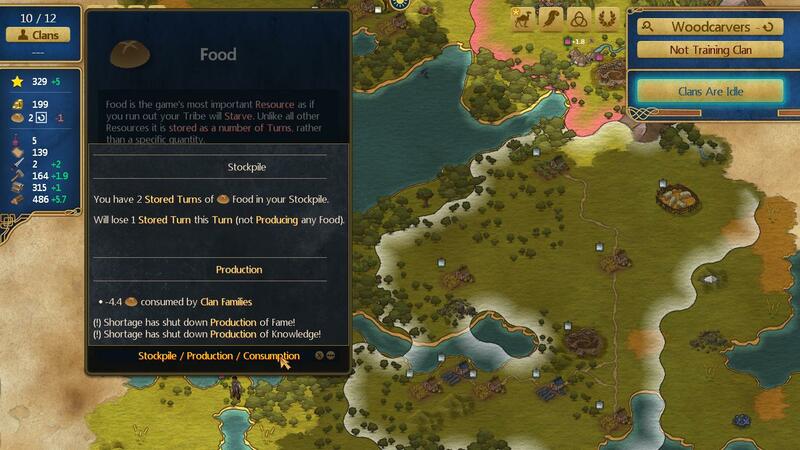 Also, the caravans give turns of food for each food item. The caravans should give a hard value in food rather than a hard value in turns. This problem involves cattle and things like honey. If they can be consumed as food, they now automatically become turns of food (except, as I said earlier, not proportionately to what a hassle it is to gather that food). A few more screens where you can control how much is used and how, would be nice. Just an advice.